When it comes to electricity consumption, the average consumer is a passive consumer. Electricity arrives in our homes via hidden wires and we consume it without really thinking about where it comes from, or how much it costs to produce. It is hard to consumers to associate their daily activities to specific levels of electricity consumption (Burgess and Nye, 2008; Hargreaves et al., 2010) and so, consumers tend to overestimate the energy use of visible electricity consumption such as lighting, and under estimate the use of less visible consumption (Attari et al., 2010). Smart meters are being progressively introduced into households across Europe in order to allow households to see how much they consume on a day-to-day basis, and to incentivise them to reduce their consumption via various means. Smart meters correct a market failure of imperfect information, as consumption data collected via traditional meters can be inaccurate (Carroll et al, 2014). The consumption information that consumers receive from their monthly bills are often based on an estimate of their consumption as calculated by the energy company with meter readings taking place perhaps quarterly. Smart meters, by allowing the collection of real-time energy consumption data give the consumer more accurate and more regular information about their consumption, thus allowing the consumer to take an active role in their energy consumption. The majority of electricity tariffs do not reflect the actual cost of producing electricity. Often, consumers pay a flat rate for the consumption no matter the time of consumption. Yet, electricity consumed during the day does not have the same production costs as those consumed during the night. The former cost significantly more to produce and distribute (Faruqui, 2010). This flat-rate pricing gives electricity an unlimited quality from consumers’ point of view; no matter how much they consume, no matter when they consume it, the price per kWh remains the same. In addition, electricity consumption is generally a relatively small part of a household’s bills which increases the unlimited dimension of electricity. Dynamic pricing has long been proposed as a way to control energy use by providing consumers with tariffs which better reflect the true costs of energy production thus incentivising consumers to take part in demand response, i.e. encouraging consumers to respond to higher prices by lowering their demand for electricity, and to shift their consumption to times when electricity production is cheaper. Households are incentivised to lower their consumption through financial (monetary incentives, monetary information), and non-financial (personalised advice, individual, real-time, and comparative feedback) incentives. The incentives are designed to either make it more costly for consumers to consume as they usually do, to provide them with greater information about their consumption so that they can target types of consumption which can be reduced, or to exploit behavioural biases to nudge consumers towards lowering their consumption of electricity (Thaler and Sunstein, 2008). I find that, on average, real-time feedback and monetary information incentives have the greatest effect on energy consumption with an average reduction in consumption of almost 3% (weighted by sample size of study). Monetary incentives have the smallest effect on energy consumption with a weighted average reduction in consumption of 0.99%. I further explore these studies via a graphical analysis of average reduction in energy consumption in relation to different factors. When households are randomly assigned to receive incentives, there is a smaller variation in the reduction in consumption. In addition, when households choose to participate in a study, greater levels of energy reduction are achieved. These households may be particularly motivated to reduce their consumption. As such these studies may show a greater reduction in energy consumption than if the incentive were to be implemented at a national level. This provides support for the idea that a one-size-fits-all policy may not be the most effective. However, a tailored approach may not be feasible. This has important policy implications given that dynamic pricing is often not readily accepted by consumers (Alexander 2010). Turning now to a comparison of behaviour in response to a nudge or a peak pricing tariff. I explore, in a stylised energy consumption game, whether individuals consume less when nudge to do so or when the price of consumption is increased. I nudge individuals to reduce their consumption by showing them a happy face if they are consuming below or at the optimal level, and a sad face if above. I find that the nudge is understood and integrated into individuals’ decision making quicker than an equivalent price. When examining solely the behaviour of individuals in response to a nudge, I find that although consumption is reduced on average, at the individual level, those who tend to under-consume initially continue do so, and those who overconsume continue to overconsume. This research has policy implications: does the use of such a nudge, which appears to separate individuals by their level of consumption, lead to a greater divergence in residential electricity consumption behaviour? In a real-life setting, are households who consume less most willing to make the effort to reduce their electricity consumption, whereas those households with higher levels of consumption are not? 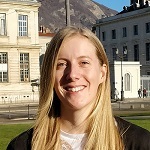 Penelope Buckley is currently completing her PhD at the Université Grenoble Alpes with Grenoble Applied Economics Laboratory. Her thesis is on “Dynamic pricing and smart meters: An experimental analysis of household electricity consuming behaviour”. Using methods from experimental and behavioural economics to explore how individuals and households respond to different incentives aimed at encouraging them to reduce their energy consumption. She has a joint Master’s degree in Economics, Statistics and Management from the Université Grenoble Alpes and Grenoble School of Management, and completed her undergraduate studies at the University of Kent.